With the release of iOS 4.2, Apple allows owners of iPhone 4, iPod Touch 4th gen, and iPad to use the Find My ‘iPhone’ feature of MobileMe for free. It does not work out-of-the-box however. You will have to set up tracking on each of your devices. You start by creating a MobileMe account through the Mail, Contacts, Calendar section under Settings. If you do not own a MobileMe account, you will be able to register with your Apple ID account. 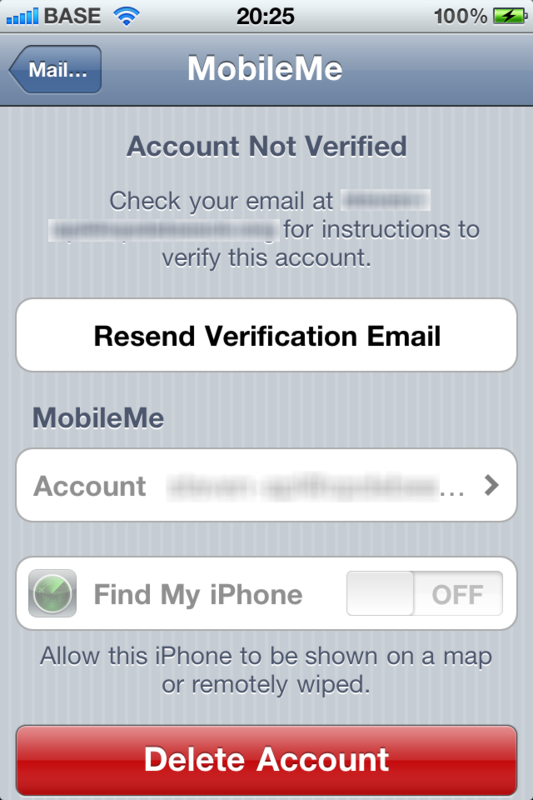 After an email verification process, you will be able to activate Find My iPhone through the settings of the just created MobileMe account. It might take a while for the settings section to register the verification, close settings and try again after a while. Turns out the Apple website has some more screenshots as well. Users vs. Designers: Who bites the bullet? In brief, [Apple’s] philosophy seems to be to ship only what’s great and leave out the rest. That’s why, instead of having a bad copy-and-paste implementation for the iPhone’s first two years, we just didn’t have one at all. I believe this is an essential difference between the conscious Android and Apple user. Apple users have come to expect every feature to work just right — in the tightly controlled iPhone environment. They rely on Apple to weigh off every tradeoff, and make the hard decisions before releasing. Was it a long wait for copy/paste to first appear after two years? Hell yeah. A year down the road, it’s still a lot more elegant and easier to use than in Android’s Froyo release. While Android deals in feature count and manufacturers focus on hardware checklists. A bright spot on the horizon, or just a bad rumor: Google’s Android team will start focussing on usability in a next release. I never make technology-buying decisions based on future promises, rumors, or potential. [..] I don’t buy things that are “getting better”, because they usually don’t. Whatever caused them to be lacking in their current release will usually prevent them from being great in future releases. Let’s just hope they won’t hack it in now, and design it some time later. Multi-tasking has failed if I have to start worrying about background apps draining my battery while it’s in my pocket. It’s the same reason why I like the Macbook’s safe-sleep feature so much. I don’t have to worry about it after I close the lid and put it in my bag. It goes to sleep and minimizes battery drain, until I need it again, in which case it’s fully usable in a matter of seconds. And it hasn’t failed me in over 4 years. The only reason they deemed iOS4 multitasking horrible is because they weren’t using it in a typical multitasking scenario. Nobody multitasks actively between 20+ applications. Not on a desktop machine, and certainly not on a handheld. This only occurs when you’re taking the feature for a spin, before sensationally tearing it down in an article or post. You’re one the road, working on an e-mail to a colleague, but you’re not really happy with the result just yet. You decide to take your mind of by playing some Tilt to Live. However, half-way through your attempt at a killer score, you get texted by a friend who needs the telephone number for that great mexican place. You know you don’t have it in your address book, so you launch the browser to look it up. You switch back to the text message, paste in the number and send it through. You switch back to your game, exactly where you left off, but fail miserably at breaking your record. You switch back to mail, finish off the reply and send it on its way. This scenario required you to switch between 4 application. You start both the game, and the browser from the homescreen. Firstly, because you are starting a new task, and secondly, because you don’t remember having the browser nor the game open in the last few hours. You could go flicking through the task switch banner, with varying success of finding both apps open. Use both features for what they are meant for, and you should never have to worry about having to flick through 5 rows of tasks. Nor should you worry about manually closing apps. The only reason Apple put this feature in, is as a faster alternative for killing frozen applications. Previously this required holding the lock button, followed by holding the home button for 10s. Relax on the micromanagement, the iPhone will kill applications for you when memory resources are getting scarce. It doesn’t expect you to start killing off applications manually to cope with the issues of its halfhearted implementation. Posted on 2010/07/11 2012/01/05 Categories UncategorizedTags iOS, iPhoneLeave a comment on Users vs. Designers: Who bites the bullet?